Genuine UK military issue camouflage 'scrim' net. This size intended as a helmet net. 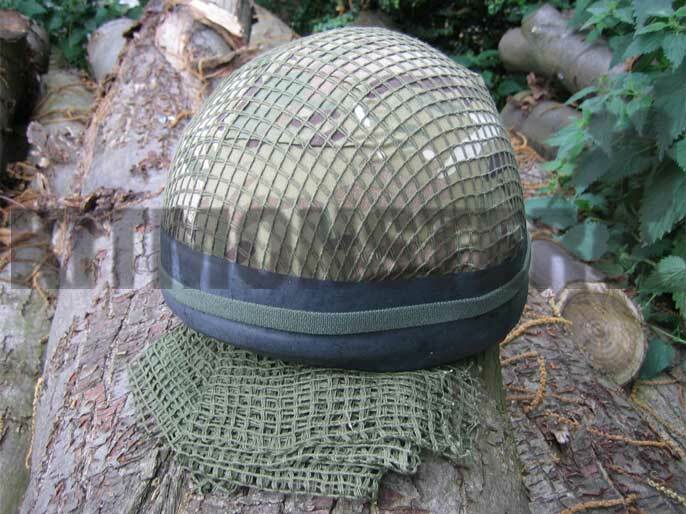 Suitable for for Para Helmets, MKVI, MKVIA, MKVII, SFCT and Gen Tex. Larger sizes available, please see separate listing. Scrim nets have enjoyed a resurgence in popularity as a helmet net for Afghanistan. A green scrim over the desert camouflage cover reduces the visibility of a helmet under bright moonlight. In use since World War II and still relevant. Single net, large enough to cover a single helmet. Net requires trimming to fit. Shown here over MTP, but equally effective over DPM. Nets obtained from a surplus source, most are new but not all. Net supplied is shown folded in the foreground. MKVI Helmet and Helmet Scrim Kit for illustration only, neither included, please see separate listing for the kit.